Thank you for visiting! 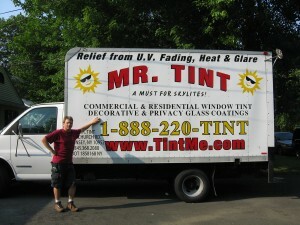 At Mr. Tint Glass Tinting, we can fulfill all of your glass tinting needs! Our 34 years of experience serving the NY-NJ-CT tri state area will bring you a Tradition of Excellence and Customer Satisfaction. To view why you may need window tint, click on Why Tint. To view information on our solar window film supplier, click on www.llumar.com. To view what our window films may look like on your home or building, click on Our Work. Be it for your home or office, there are many choices for window film glass coatings. Robert Greenberg founded Mr. Tint Glass Tinting in 1981. What makes him a master of this craft today? Find out! Mr. Tint can help you make the best decision for your window tinting purposes. Check out some of our work!